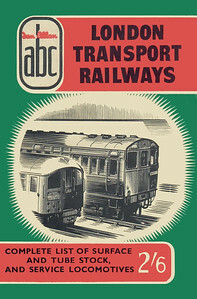 The first London Transport ABC was published in 1944, containing details of London Transport trains, buses and trams; the next (in 1950) featured only underground trains, the buses & trams b now meriting their own book. A 1951 edition followed, and from then, the book was published every one, two or three years until 1969. Some earlier and later related oddities are included here. 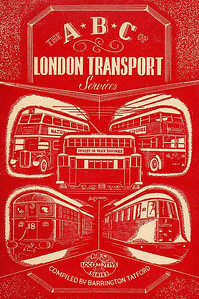 1944 ABC of London Transport Services, 1st edition, by Barrington Tatford, published December 1944, 48pp 2/-, no code. The first London Transport ABC, containing some details of LT underground locomotives & tube stock, also buses, trams & trolleybuses. Reissued with original cover in 2004 (see Section 012). 1950 London Transport Railways No.1, by S L Poole, published March 1950, 73pp 2/-, code: 101/338/100/350. First ABC containing just underground locomotives & stock, buses & trams by now to be found in a seperate edition. 1951 London Transport Railways, by S L Poole, published February 1951, 65pp 2/-, code: 159/460/100/251. After this edition, the LT ABC books appeared sporadically from between one to three years until 1969. 1955 London Transport Railways, by S A Newman, published October 1954, 56pp 2/-, code: 398/C/100/1054. This was effectively the 1955 edition, being published in October 1954. 1957 London Transport Railways, published March 1957, 64pp 2/6, code: 590/417/100/357. Copies of this edition have been noted with code 590/417/100/317, which would indicate being published in March 1917, so no doubt a batch were produced with a typing error; also some copies didn't have a code. 1959 London Transport Railways, published August 1959, 65pp 2/6, code: 922/547/125/859. Although produced in August 1959, this was officially the 1960 edition. 1961 London Transport Railways, published December 1960, 64pp 2/6, code: 1033/628/15/1260. 1963 London Transport Railways, published December 1962, 72pp 2/6, code: LTR/1192/796/150/1262. 1966 London Transport Locomotives and Rolling Stock, published December 1965, 72pp 4/6, code: 1434/218/1265. This 1966 edition was in a larger format than previous books in the series, and the price was dramatically increased by 2/- to 4/6. 1969 London Transport Locomotives and Rolling Stock, published September 1968, 64pp 6/-, SBN 7110-0078-6, no code. Still in larger format, and a further price rise of 1/6 to 6/-. 1978 London Transport Rolling Stock & Locomotives, published May 1978, 64pp 95p. ISBN 0-7110-0604-0, no code. 1951 London's Underground, 1st edition (hardback with dust jacket), by H F Howson (photos by O J Morris), published 1951, 144pp 12/6, no code. Subtitled 'The story of the development of the world's largest urban transport undertaking'. As the next photo shows, the cover was used for the pictorial survey, using the majority of the photos from this publication. 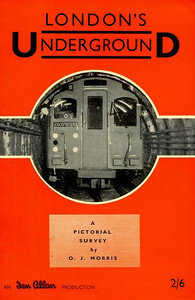 1951 London's Underground - A Pictorial Survey, 1st edition, by O J Morris, published 1951, 30pp 2/6, no code. This softback was essentially the previous book without the H F Howson storyline, using all but four of the O J Morris photos used in that book. 1960 London's Underground, 2nd edition, by H F Howson, published September 1960, 120pp, code: 1035/630/25/960. Hardback, 23cm x 16cm. 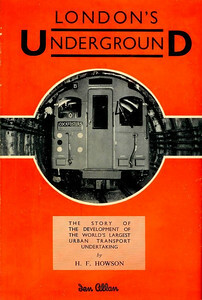 1962 London's Underground, 3rd edition, by H F Howson, published July 1962, 125pp 21/- code: 1168/778/250/762. Hardback, 23cm x 16cm. 1967 London's Underground, 4th edition, by H F Howson, published 1967, 142pp 30/-, code: 102/411/CEX 1967. Hardback, 23cm x 16cm. 1981 London's Underground, 5th edition, by H F Howson, published 1981, 160pp £6.95, ISBN 0-7110-1043-9. Hardback, 23cm x 16cm. 1988 London's Underground, 6th edition, by H F Howson, published 1988, 160pp £7.95, ISBN 0-7110-1559-7. Hardback, 23cm x 16cm. 1991 London's Underground, 7th edition, by John Glover, published 1991, 160pp, ISBN 0-7110-1899-5. Hardback, large format. 1999 London's Underground, 9th edition, by John Glover, published 1999, 160pp, ISBN 0-7110-2636-X. Hardback, large format. 2003 London's Underground, 10th edition, by John Glover, published November 2003, 160pp, ISBN 0-7110-2935-0. Large format 21.6cm x 29.2cm. 2010 London's Underground, 11th edition, by John Glover, published June 2010, 160pp £19.99, ISBN 0-7110-3429-X. Hardback, larger format 21.6cm x 29.2cm.. This cover was just a promo shot, see next photo for the published cover. 2010 London's Underground, 11th edition, by John Glover, published June 2010, 160pp £19.99, ISBN 0-7110-3429-X. Hardback, larger format 21.6cm x 29.2cm. 2015 London's Underground, 12th edition, by John Glover, published 2015, 192pp, ISBN 0-7110-3826-0. Hardback, large format. 1997 London Underground, by John Glover, published November 1997, 96pp £7.99, ISBN 0-7110-2545-2, code: 9711/C2. 2009 London Underground Rolling Stock In Colour, by John Glover, published October 15th 2009, 96pp £16.99, ISBN 0-7110-3348-X. Paperback, larger format 21.4cm x 28.1cm. 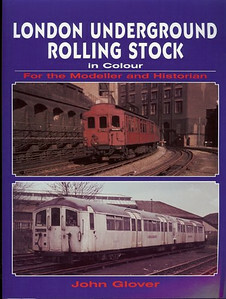 2014 London Underground Rolling Stock Guide, by Ben Muldoon, published July 2014, 96pp £13.50, ISBN: 0-7110-3807-4. Softback, 21cm x 15.2cm. 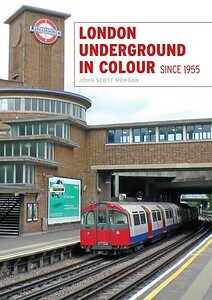 2013 London Underground In Colour since 1955, 1st edition, by John Glover, published September 2013, 96pp £20.00, ISBN 0-7110-3700-0. Hardback, 30.5cm x 20.8cm. 1994 London Underground Stations, by David Leboff, published November 1993, 160pp £7.99, ISBN 0-7110-2226-7, no code. Reprinted February 1994, £7.99, same ISBN, no code. 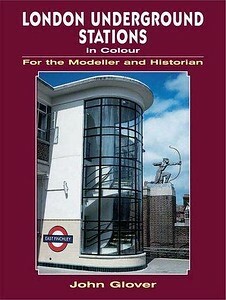 2009 London Underground Stations For the Modeller and Historian, by John Glover, published 2009, ISBN 0-7110-3349-8. Softback,,larger format. 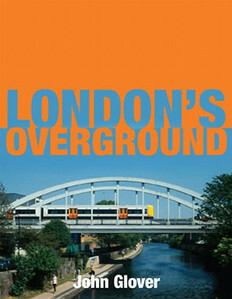 2012 London's Overground, by John Glover, published February 2012, 128pp £24.99, ISBN 0-7110-3524-5. Hardback, larger format 21.6cm x 29.2cm.